You’ll have noticed that things have been a little quiet around here but it’s not because I haven’t been blogging. Sometimes I feel blogging on my laptop doesn’t produce my best writing and I was feeling a little overly attached to my computer so I went on a quest to try blogging and being creative somewhere other than my laptop. I wanted to try a little something new – or perhaps a little more old school. So I turned my hand to our good old fashioned friends, pen and paper to get the blogging thoughts flowing more clearly. Every day whenever I find the time I’ll head over to my document of blog post ideas which I have saved on Microsoft One Note or in the notes section on my phone. As some of you may know I’ve been working a bar for the summer but during the Edinburgh Festival Fringe it all gets pretty manic. After being on my feet all day my brain tends to switch off when I get in (sometimes at 3am) and there’s just no blogging oomph left. So I’ve been making the most of my lengthy bus journeys to get a little bit of handwritten blogging in. This means the bulk of the writing is done so that I can get it all typed and onto the internet whenever I can squeeze in laptop club and don’t want to just laze around and watch my favourite telly programmes or Youtubers (The Michalaks FYI). In the morning I will choose one idea I’m feeling particularly inspired about and jot down all the ideas by hand that I have for that post in my notebook. I always try to think about what the story I’m trying to tell with the blog post is and it helps me focus my writing better rather than going off on my speciality of endless ramble. Then I write the blog post up really roughly and as the thoughts come then go through the post teacher styley with a red pen to try and get the best writing out of myself (I actually really enjoy marking myself and do this with all my legal essays... sad right?). This means the bulk of the writing is done offline in my spare moments so then I can get it all typed and onto the internet whenever I can squeeze in laptop club and don’t want to just laze around and watch my favourite telly programmes or Youtubers (The Michalaks FYI). I’ve also been trying to read more in my quest for improving my blogging while being offline. I was always taught way back in ye olde days of school that the best way to improve your writing was to read as much as possible. So I’ve been getting back to the books with the help of a sunny holiday or two. While I was away I read the wonderful ‘KabulBeauty School’ by Deborah Rodriguez. This is the second of her books I have read and I am always fascinated by the true stories behind the books and the difference in culture – as always its people’s stories that capture my imagination. But that’s because I’m probably the nosiest person you’ll ever meet but I’ll put it down to healthy curiousity haha. I also read ‘I Dreamed A Dream’ by Giovanna Fletcher because I love a good piece of chick lit. I genuinely feel so much more productive having read and thought for half an hour than aimlessly wasting three while scrolling through Twitter (though you have to indulge sometimes!). Another inspiration offline for blogging has been the rekindling of my love of magazines. If you follow me on Instagram you’ll have seen that I’ve showcased a few of my old magazine collection previously. I used to be OBSESSED. I had a large collection of Elle UK, Elle Collections, Teen Vogue, Elle Girl and Cosmopolitan and still have it all to this day. I’m also particularly proud of my collection of foreign magazines which I collected from holidays and lovely friends brought me home. It’s strange how editorial and styles are so different even though places such as France are so close. There’s something just so exciting about reading a magazine which I think is why I also love blogging and reading blogs so much. They’re basically online magazines but with a far more personal and accessible touch. So recently I’ve been easing myself back into my love of magazines with the hope that the ideas, inspiration and writing styles inspire me offline for my own online blogging. I also decided I wanted to start learning how to do lettering with my brand new snazzy collection of sharpies. My favourite blogs have that little arty and personal touch to them – so I had the wild idea that perhaps I could do some illustrations for blog posts. I’ve always been into art and design and studied it to advanced higher level but I’m a tad bit rusty so it’s all about doodling and practising just now to get my pen control back up. Hopefully I’ll get to the stage where I can add some little personal illustrations to my header – that’s the end goal anyway! (P.s. if any of you have any bright ideas of little things I could illustrate which remind you of me or my blog I’d love to hear them so I can try some ideas out for the header!). But right now this is a part of offline blogging which is very much a work in progress. As a result of these paper times I feel like so many more ideas are flowing out of my head. Instead of getting distracted by random pregnancy announcement YouTube videos or Twitter beef I can actually let my mind think through some ideas. Since you’re here reading I’ll give you a spoiler - I now have some posts all written and ready to go here on www.laurakathren.com thanks to offline blogging including posts about law, bloggers, hidden gems of Edinburgh, student guides and my lil Instagram project and I’m pretty bloody excited to show you them. I’m finally getting happier with their quality. Even though the entirety of blogging is online with the importance of the upkeep of your website, promotion on social media and general interaction it’s always good to step away from the keyboard, disconnect and strip back blogging to the content at its core. Whether that be doing more stuff offline to blog about or actually clearing your head of distractions and actually blogging offline it can actually be pretty refreshing. And anyway I can’t think of a better way to blog than with a pretty notepad and pen lying in the sun with a glass of wine in hand, can you? Is there anything you do offline which helps you blog better? This is so interesting to hear about! Offline blogging sounds like such a good way to get more creative. Admittedly all my blogging work and inspiration is done online but maybe I should try to blend between the two a little more. Also I bought my mum The Little Coffee Shop of Kabul which was excellent (obviously got my hands on it straight after her!) - now I'll be looking out for the Beauty Shop one. I was writing paper diaries before I started blogging (so, 20 years ago, haha) and in the old LiveJournal days a lot of my posts were typed up versions of those written entries. It's still a trick I use if I really want to focus on something: most of my mental health-related posts start out written. I love this post, Laura and couldn't agree more. My love for writing started with a paper and pen and it'll always stay that way. I was writing journals and stories by hand long before I started blogging. I also love magazines, they provide such inspiration! I've been subscribed to Elle UK for years and The Simple Things is my new favourite. It sounds like you're trying out lots of different creative projects and I'm sure that they will fuel your life online. Can't wait to see your upcoming posts! This is such an interesting take on traditional blogging--I think you've convinced me to give it a try! Thanks Tori! Just visited your blog and love it! Let me know if you give offline blogging a try! I love working online some of my most authentic pieces are hand written. It's true sometimes you just need to go it old school! Thanks for sharing! YES! I love to just take my notebook and write out my posts! I've found it makes our words more intentional and open, as we write without pressure or stress in our notebooks and then can review our words as we transfer it online. I've also wanted to get into lettering more. I think it is such an amazing art! Hi Gina!! Yeeey glad you love writing in notebooks too (I'm such a notebook fiend). 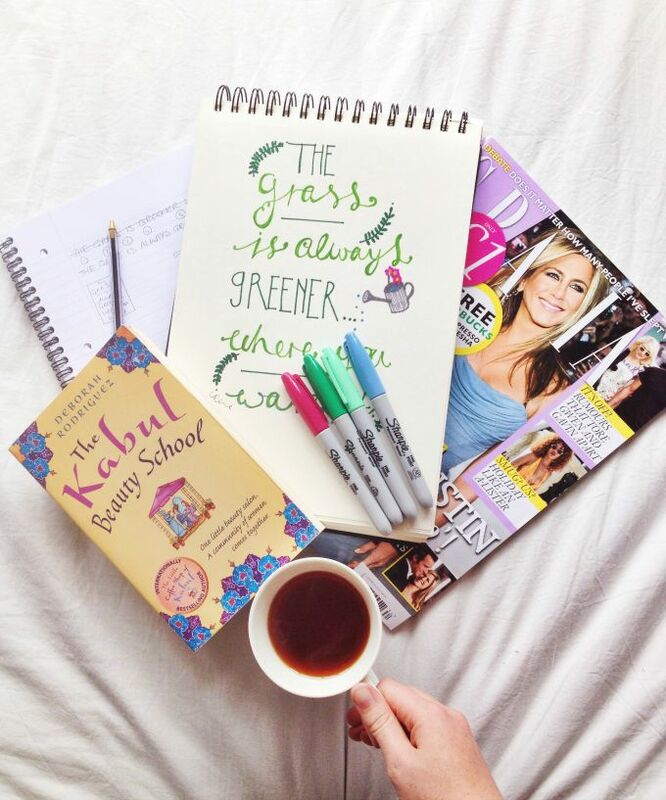 I totally agree with you - there's no stress when you're just scrawling away!